DALLAS (Jan. 30, 2018) — Arcis Golf, the second-largest owner and operator of golf facilities in the United States, has acquired TPC Valencia from FivePointÒ, a developer of mixed-use, master-planned communities in California. The upscale, private club is located in Valencia, Calif., approximately 35 miles northwest of downtown Los Angeles in the Santa Clarita Valley. TPC Valencia, which opened in 2003, was designed by PGA TOUR Design Services, in consultation with two-time major champion Mark O’Meara. 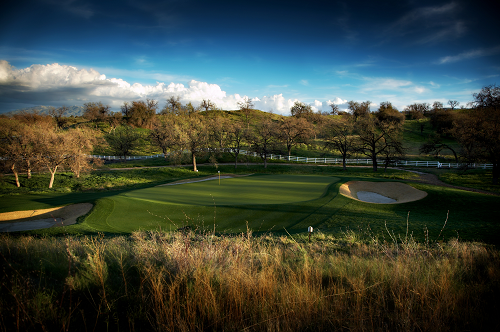 The par 72 course stretches 7,218 yards at championship length with a routing that offers sweeping valley views, complemented by an adjacent majestic oak preserve, and large greens. The club’s stunning 32,400 square-foot “Old California” ranch-style clubhouse evokes a feeling and sense of casual elegance. Arcis Golf’s footprint in the Santa Clarita Valley now includes both this facility and Valencia Country Club, the venerable Robert Trent Jones, Sr. design, which the company also owns. The two clubs are literally “across the street” from one another along Interstate 5. This burgeoning market includes several affluent communities throughout the valley and 21,500 future homes in nearby Newhall Ranch. The company plans significant capital reinvestment in both golf courses and clubs, as well as enhanced service levels, a robust travel reciprocity program, amenities, and programming to further broaden the appeal for members and guests. Upon completion, the club will be rebranded as part of a multi-club lifestyle amenity to the community. A club industry leader in providing inventive direction and unrivaled lifestyle amenities that complement exceptional playing experiences, Dallas-based Arcis Golf has expanded its portfolio of owned and operated clubs to include over 60 private, resort, and daily-fee club clubs throughout the US. LORETO, Baja California Sur, Mexico (January 25, 2018) — What’s better than playing the newly completed Rees Jones-designed golf course along the Baja Peninsula or fishing in the indigo waters of the Sea of Cortez? Doing both in the extra-special “Unlimited Golf & Fishing Package” offered by Villa del Palmar Beach Resort & Spa at The Islands of Loreto. Guests can play continuous rounds of golf, as many as desired, at the dazzling new Danzante Bay Golf Club – featuring 18 holes overlooking the ocean – and go fishing in an area once described by Jacques Cousteau as the “aquarium of the world” on a privately chartered boat. The “Unlimited Golf & Fishing Package” also features lodging for three nights in a Deluxe Studio Suite at Villa del Palmar Beach Resort & Spa, a Villa Group property that features 4,447 acres of unspoiled beauty along one of the most breathtaking spots in the hemisphere. The package is available now through May 30th, travel window from now until December 20th, 2018. Guests can choose either an all-inclusive or European package option. Villa del Palmar Beach Resort & Spa at the Islands of Loreto boasts stunning views of the Sea of Cortez and Sierra de la Giganta Mountain Range, three outstanding restaurants, five swimming pools, the luxurious Sabila Spa, beautiful beaches, tennis courts, miles of hiking trails and sport fishing. Part of a luxury master-planned community adjacent to the coastline of Baja’s inland Pacific marine sanctuary, Danzante Bay Golf Club has five sets of tees, ranging between 4,916 and 7,237 yards, and features wide fairways and greens that must be carefully judged but are never unfair. Most of the entrances to the greens are open — allowing approach shots to run on safely — while the holes along the cliffs feature strategically placed collection areas to keep errant shots from taking the plunge into the blue water below. Along with the changing terrain, the winds can be different day to day and even during the day, conditions that influence shot value and strategy. The resort is just a two-hour flight from Los Angeles International Airport (LAX) via Alaska Airlines and is accessible seasonally with direct WestJet flights from Calgary, and from Tijuana via Calafia Airlines. For more details, visit www.villadelpalmarloreto.com, call (800) 790-4187, or email reservaciones.vdpl@vgloreto.com. For additional information on Danzante Bay Golf Club, visit www.danzantebay.com. Villa del Palmar at The Islands of Loreto is a luxury destination resort on the Sea of Cortez, off the eastern coast of the Baja peninsula overlooking Danzante Island (one of five in the region). Flanked by the rugged Sierra de la Giganta range, the Villa del Palmar is the first and only resort to occupy one of the Gulf of California’s last virgin coastlines. The resort features 181 new, spacious, beautifully appointed Deluxe Ocean View, one, two and three bedroom Suites with terraces and stunning ocean and mountain views, timeshare options, three restaurants offering gourmet dining, an attentive English-speaking staff, five swimming pools, a 39,000 square-foot Sabila Spa and Wellness Center, two tennis courts, beautiful beaches and a mild and warm climate year-round. Guests can enjoy PADI-certified SCUBA diving lessons and snorkeling tours in the protected indigo waters that explorer Jacques Cousteau once dubbed the “Aquarium of the World.” Outdoor adventurers can also experience tours of the nearby Danzante and Del Carmen Islands atop an inflatable APEX boat, as well as swimming, world-class fishing aboard the “Mad Dash” tournament boat, paddle boarding, kayaking, whale watching and mountain biking. With shuttle service priced at $10 per person round trip, guests can explore the historic town at the Islands of Loreto and visit the 1697 mission that made the town famous. The area is also known for its wildlife, including the 900 species of fish off the coast and in an area that has been designated a UNESCO World Heritage Site and the second largest National Marine Park. Hotel perks include a spa and fitness center, massages and salsa dance lessons. Travelers can take a short flight from LAX on Alaska Airlines or from Calgary, Canada aboard WestJet, Canada’s most-preferred airline, to the Islands of Loreto. (DUBLIN, Ireland) – Carr Golf – Ireland and Scotland’s premier provider of unforgettable golf vacations – will exhibit as part of the Golf Ireland booth (#3273) at the 2018 PGA Merchandise Show at the Orange County Convention Center in Orlando, Jan. 23 – 26. Carr Golf will also host nightly fun gatherings during the week for its partners, media and clients at Topgolf Orlando adjacent to the Convention Center. The full-service tour company specializes in unrivaled customer care for groups of all sizes and premier “one-of-a-kind” itineraries featuring luxury accommodations, transportation, sightseeing, fine dining, caddies and anything else needed for stress-free, extraordinary golf vacations. Carr Golf additionally works directly with a multitude of North American PGA club professionals on incentivized member and association getaways. Carr Golf just announced its 2018 Ryder Cup Package for the celebrated biennial event taking place at France’s Le Golf National, Sept. 27 – 30. The five-night stay (Sept. 26 – Oct. 1) in the center of the dramatic “City of Light” features four- and five-star accommodations, daily breakfast, gifts, Ryder Cup tickets to the final practice day and opening ceremony (Sept. 27) as well as three days of competition and trophy presentation (Sept. 28 – 30). Daily ground transportation to and from the hotel and Le Golf National is included. Carr Golf also recently announced packages for the 2019 Open Championship (July 18 – 21) to be played at Northern Ireland’s Royal Portrush Golf Club for the first time since 1951. Along with the opportunity to attend the historic event, the offer includes luxury accommodations, tee-times on several of the world’s finest links courses and a personal driver. Carr Golf will showcase a wide array of unique events including the 29th Annual World Invitational Father & Son Tournament (Aug. 8 – 12) and 11th Annual World Invitational Father & Daughter Tournament (July 23 – 26), both held on Ireland’s Waterville Golf Links. Carr Golf announced the 2nd Annual Donald Ross Invitational Tournament to be held in September 2019 on Scotland’s renowned Royal Dornoch Golf Club as well as nearby Castle Stuart Golf Links and Brora Golf Club. The nearly 30-year-old company has been experiencing unprecedented demand for itineraries featuring the great links courses of Scotland and Ireland. Carr Golf can currently guarantee August 2018 tee-times on Muirfield Golf Club, Royal County Down, Old Head Golf Links and Ballybunion Golf Club. Carr Golf works closely with numerous additional world-class layouts including The Old Course in St. Andrews, Portmarnock Golf Club, Portstewart Golf Club, Royal Troon, Tralee Golf Club and Lahinch Golf Club as well as lesser known “must play” gems including Carne Golf Links, Enniscrone Golf Club, Dooks Golf Club and Ardglass Golf Club. For more information on Carr Golf: www.carrgolf.com, 1.855.617.5701 (U.S. toll free) or +353.1.822 6662. Today, Joe’s son, Marty, operates the business as executive chairman. His brother Roddy is also actively involved. Named winner of Golf Digest’s Editors’ Choice Award for “Best Tour Operator” in 2016 and 2017, Carr Golf Travel hosts numerous prestigious annual events including the World Invitational Father & Son Tournament, Invitational Father & Daughter Tournament, Donald Ross Invitational and a number of Invitational Links Pro-Am tournaments in Scotland, Northern Ireland and Ireland’s southwest. Moreover, the company is at the forefront of corporate event implementation, as well as developing itineraries built around the Ryder Cup, Solheim Cup, College football and NFL games in London.